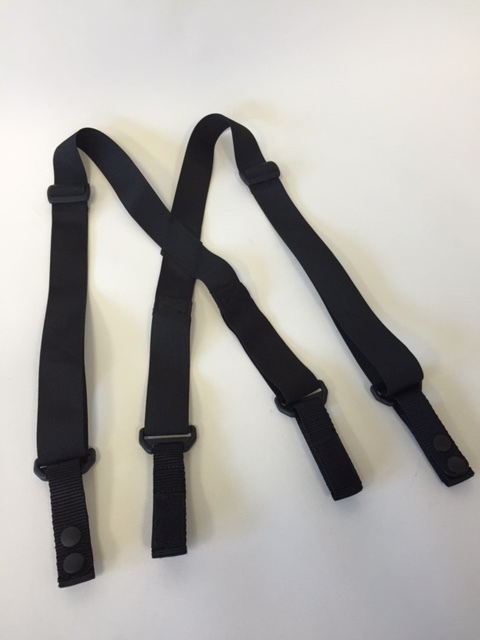 L&M Tactical duty belt suspenders are manufactured at our facility using high quality nylon webbing. Our suspenders come with elastic panels on the rear of the suspenders to allow for movement of the wearer during use. All plastic and metal hardware component's are high quality rated for military use. All suspender sizes have a wide shoulder to waist distance adjustment range to allow for different body shapes and sizes. To minimize lateral sliding on the duty belt, we sew Velcro panels onto each belt loop that will lock into the duty belt Velcro system. High stress point seams have box tacks to provide superior strength in these areas further reducing the possibility of product failure. Standard sizes include Small, Medium, Regular, Tall & Extra Tall. Custom sizing available.